It is widely acknowledged that historically intensive human disturbances increased erosion and sediment delivery rates to extreme levels in the 1950s through the 1970s across the north coast, and are likely continuing to affect turbidity durations to some degree. A more controversial question is to what extent contemporary land use is affecting present-day erosion, sediment delivery and turbidity. Using turbidity exceedence levels to indicate watershed disturbance, we approached this question from several perspectives. Part A of this report follows up and expands on an earlier analysis (Klein, 2003) for which turbidity data sets from only eight sites were available. In the present study, annual turbidity data sets were assembled from up to 28 continuous turbidity and stage recording stations located on small streams in the northcoast region from Del Norte County in the north to Mendocino County in the south. Data spanning three water years (WY2003-2005) were processed to calculate lengths of time turbidity was higher than several thresholds. Turbidity thresholds ranged from 25 (frequently cited in the salmonid literature as causing ill effects when exceeded) to 1000 FNU. Turbidity exceedence analyses, similar to conventional flow exceedence analyses, were also performed, allowing comparison of turbidity levels at various exceedence probabilities. Part B of this report uses turbidity relationships to harvest rate to model potential effects on anadromous salmonids within a cumulative watershed effects (CWE) framework. 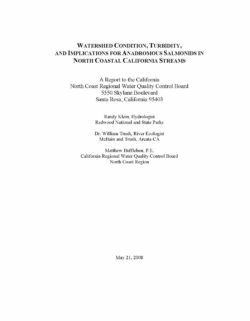 To evaluate CWEs on anadromous salmonids and the stream ecosystem, annual turbidigraphs were produced from WY1991 through WY2005 at annual average harvest rates of 0% to 6% for an 8 mi2 old second-growth watershed in North Coastal California. The turbidigraphs were very conservative in that they used the ‘Lower Bound Lines’ to estimate turbidity from discharge, rather than a line of best fit. Turbidity thresholds established at 10, 25, and 50 FNU were applied to assess chronic background, moderate, and severe stress to stream ecosystems in each water year. A simple model of smolt growth and survival-to-adult-return (SAR), as influenced by the annual turbidigraph, indicated the minimum supportable adult steelhead population size could be more than halved at the 2% average annual timber harvest rate compared to that supported by an old second-growth watershed.